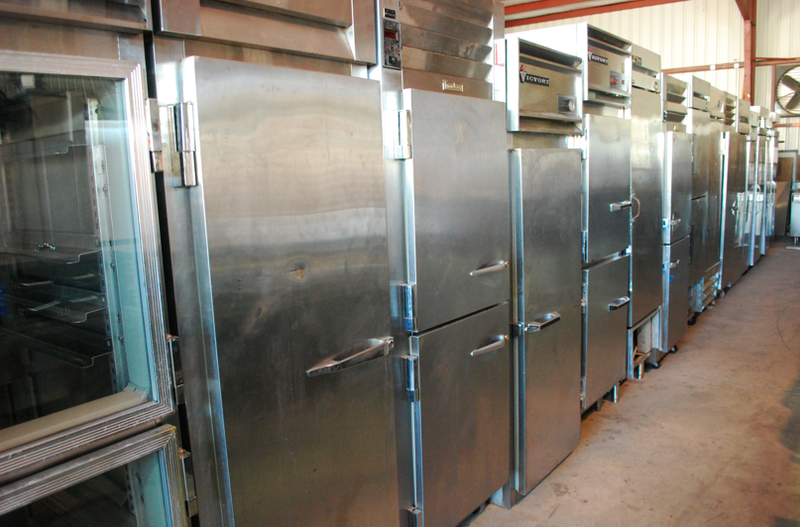 There is a wide variety of used and new commercial coolers, fridges, and freezers to choose from at the One Fat Frog Restaurant Equipment Super Mega Warehouse in Orlando and the One Fat Frog Restaurant Equipment Showroom in Sanford. Glass door fridges are great for being able to see the product before eyou open the door and they also make taking inventory a lot easier. Here’s some more information about glass door fridges. Commonly, glass-door fridges feature a forced-air refrigeration system, copper tube evaporator, and aluminum fins. Temperature is controlled by a digital, electronic control which also contains an automatic defrost. The interior and exterior are usually pre-painted steel, with polyurethane injected foam insulation. The glass door itself is commonly a triple pane heated glass door that self-closes and sports an aluminum frame. One Fat Frog Restaurant Equipment is Florida’s #1 source for used commercial restaurant equipment! One Fat Frog Restaurant Equipment can get you financed for all of the used, refurbished commercial restaurant equipment you need – including double range gas ovens. One Fat Frog Restaurant Equipment also offers quick cash discounts and package deals on the entire stock of used commercial restaurant equipment. Come by One Fat Frog Restaurant Equipment today!